Unique & Useful Ceramic Platters, Planters & More with Colorful, Rustic Flair. Artist & Teacher with a Passion for Technique & Media Exploration to Express. Making art is the classic way of sharing your passion with others, but teaching art carries this love even further by planting the same seed in others. Robin Gray of Creative Kilnworks, also known as Smilin' Robin, proves this every day, splitting her time between classes, making her own work and private lessons. That's what I'd call well rounded involvement in the Austin art community. 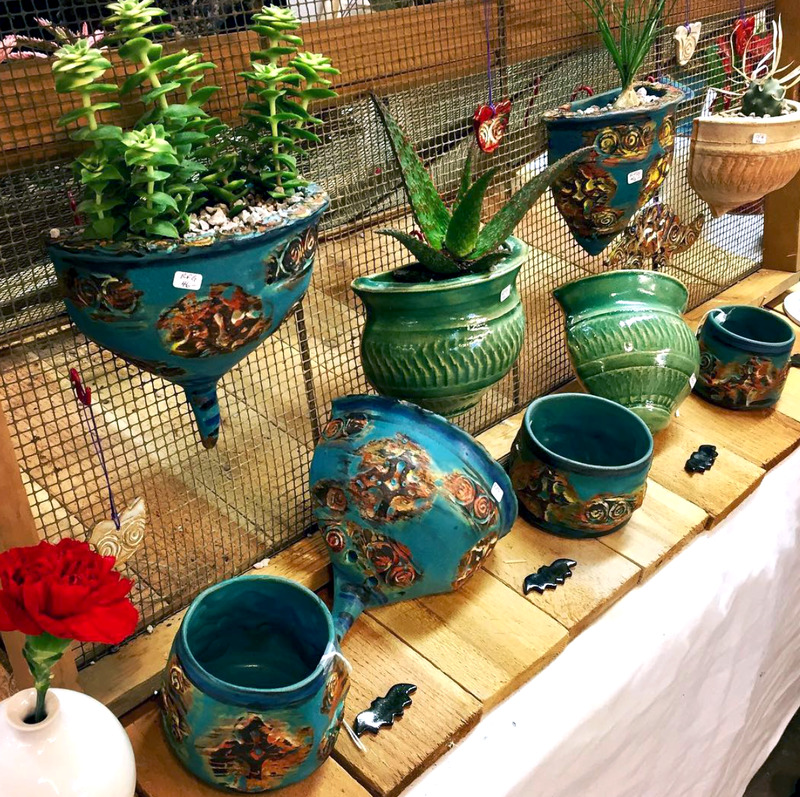 When focusing on her own pieces, you can find Robin at Fireseed Clay Art Studios along Thornton road. She is an active member of the collaborative ceramics space, sharing a similar philosophy with owner Rick Van Dyke. I imagine this environment suits Robin well as a self proclaimed "Technique Junkie." She can experiment and develop her methods while surrounded by others equally dedicated to their craft and problem solve together when any one potter meets a challenge. How fitting for an artist teacher! The best way to really learn something is to help another in their path of discovery. Robin's ceramics are designed to be beautiful and functional. From an aesthetic stand point, they are often vibrant, yet rustic with a weathered feel that looks like it took many years to perfect! 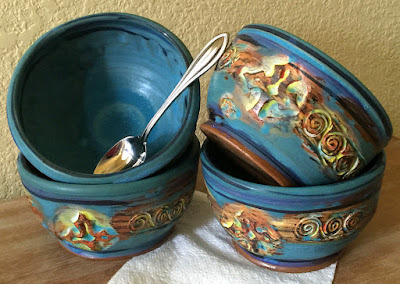 I love the mix of complementary and contrasting colored glazes that really pop once fired. Consider her use of reds, yellows and turquoise. Stunning on plates, bowls, planters, mugs and more! 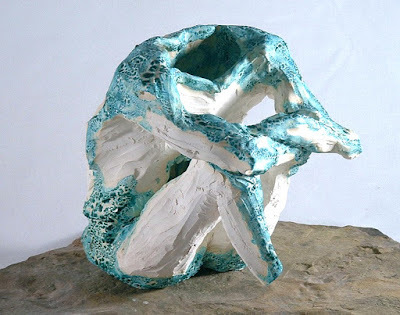 Another medium Robin has worked with and taught is Fused Glass, traces of which you can see in her more sculptural work. 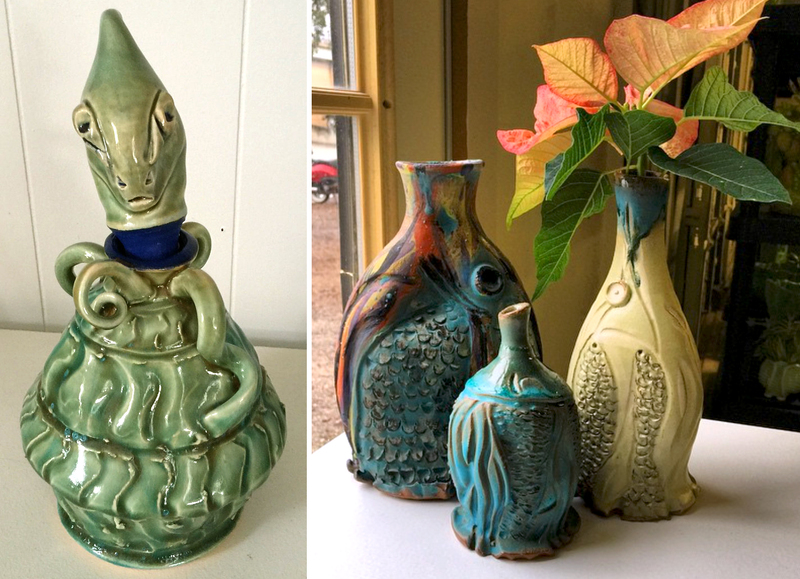 She has a unique way of turning pottery into mixed media through her knack for experimentation. If you're interested in learning from Robin you can check out the classes offered at the Dougherty Arts Center or contact her for one on one sessions at Fireseed Clay Art Studios. While I may be biased, Robin embodies the artistic ideal that keeps our city in touch with its creative roots!